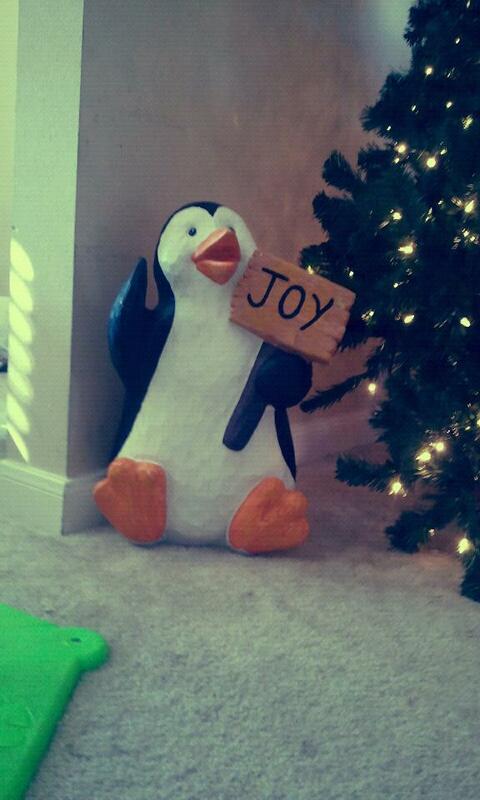 My favorite decoration ever. Never mind he stays out year round. Fred (as he’s named) looks so great in front of the tree. Well now is the time of year that things kick into overdrive. This week is pretty much going to consist of non stop laundry, packing, and wrapping presents. I also have to remember where I hid all the gifts…thats gonna be an adventure. We are getting ready to head to my Grandmothers in Athens. My mom will be here Friday afternoon, and then we are leaving for the 3.5 hour road trip. The boy usually does pretty good in the car, as long as he has something to keep his hands busy. Plus I will be in the backseat with him, so I can entertain. I’m looking forward to seeing my Aunt, Uncle and Cousin from Mississippi. *Yep, I sang that song in my head to type that out..who doesen’t!! * They have never gotten to meet Jp, so that is going to be great to introduce them! 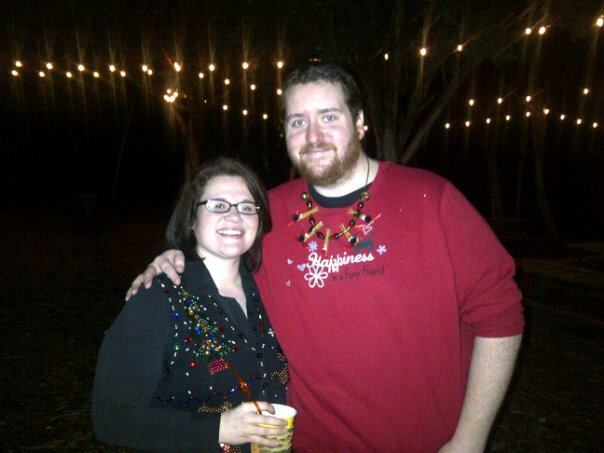 My cousin Meagan is also back from Peru, so it will be great to see her and catch up. She spent the past 11 months studying in Lima, and has had quite the adventure. I can’t wait to see all of her pictures. We were able to keep in touch through Skype and phone calls, but it will be nice to see her little face in person!! The whole family is supposed to make it in this year, so with all 20 or so of us in the house, it will be pretty busy. Even with all that chaos, it is still so calming to have everyone there!! I can’t wait to make Christmas dinner too!! I do have something on my mind though, that has been weighing heavily. I have considered writing a post about it, but I haven’t mustered up the gusto yet. I have been a tad wary about his mother, father, and sister reading this. Until now. I have chosen not to devote a whole post to the subject, just a portion. Here goes. I have a relative, we will call him Carl for the purpose of this post. Carl is an immediate family member, and will definitely be attending our Christmas festivities. One of those traditions includes gift giving. Well this past year, Carl has decided to denounce our Christian faith, and become an atheist. While I do not agree with his choice, it is his life and he may do as he pleases. What I have a problem with is Carl’s acceptance of gifts. I believe that the tradition of giving gifts comes from the Three Wise men who brought Jesus the gold, frankincense and mur. In that respect, I do not believe that Carl should accept ANY of the gifts his family purchased for him. If you are a true Atheist, you would stay away from all traditions of the season. Not just the ones that you do not benefit from. I have not purchased a gift for Carl, and I do plan on telling him why. I think it is just wrong of him to say there is no God, no Heaven or Hell, no Christmas, no Easter or any other Faith based Holiday, but to still expect for his parents and family to lavish him with gifts on the day we celebrate the birth of our Lord. That is as far as I will elaborate on my feelings of the situation. I am not posting this to start any huge discussion about Faith and Religion. I know what I believe, and that is all that matters to me and my family. I will raise my children in the Word of the Lord, and hope that I have done all I can to steer them in the right direction. So I have decided to move the blog. We have changed over to WordPress from Blog Spot. I am loving the new dashboard, and look of the site. Word Press has so many more options and is easily customizable. It was quite a task to get everything moved though. I spent most of the day Friday getting it done. Friday night was John’s work Christmas party, downtown at Roial. They rented out the whole place, and it was nice to finally meet the people he talks about everyday! 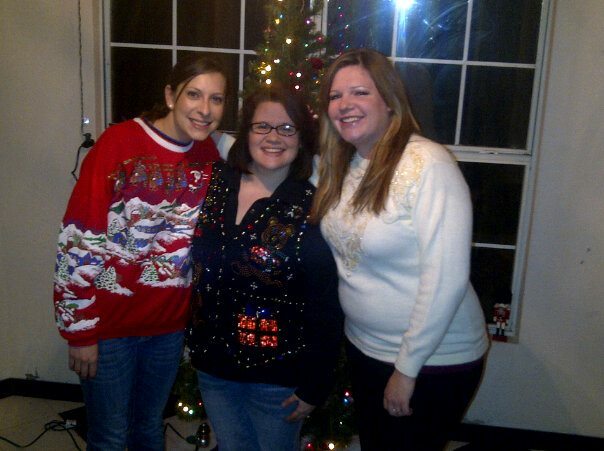 From there we headed out to mine and Jens Ugly Christmas Sweater Party. That was a blast, and everyone had a really good time. It was nice to get out of the house and see friends that I haven’t gotten to see in a while. We remembered to take a couple of pics. We have decided to make this an annual thing. Everyone looked great!! I can’t wait until next year. The busy time is just starting. We leave for Athens on Friday, so this week will be full of laundry, packing, and wrapping everyone’s presents. Yep, I’m a pretty good at procrastination so I haven’t even opened the wrapping paper!! It’ll get done though! Time to make dinner for the boys. I hope everyone had a great weekend! !